This is an endorsement of the message of liberty, not an endorsement of Ted Cruz for President. But I did and do like we he has to say. Americans, especially those that never heard Reagan, need to hear more messages like this one. -W.E. This morning I heard echoes of Reagan in Senator Ted Cruz’s speech and an historical shiver went down my spine. His announcement from Liberty University was concrete proof that Cruz is undoubtedly one of the most brilliant and gifted speakers ever to grace a political stage. He doesn’t bother using a teleprompter because what he says comes from his heart – it is second nature and honest. He made his presidential announcement in Jerry Falwell’s place – the very lap of the Moral Majority. And much to the Left’s chagrin, he has morals, principles, ethics, faith and a spine. This is a man not afraid to get down on his knees and pray. It’s like throwing garlic in the face of a Marxist vampire. The Left and the Right are terrified of Ted Cruz – he is the people’s choice. And there is not a candidate out there that is more positive, more gifted, more masterful and more charismatic at stating strongly what conservatism truly is. The long knives came out by the Left and the RINOs even before the announcement. “Moonbeam” Jerry Brown came out calling Ted Cruz, and his wife for that matter, stupid because they don’t believe in global warming. The only subject Jerry Brown is an expert on, is the one of being a moron. Cruz went to Princeton and Harvard. He didn’t have time to dally with the likes of Linda Ronstadt and get high while stuffing money in his pockets and blathering about UFOs with the two brain cells he has left. Then you have those such as Karl Rove, who should just go away. He has done nothing but lose elections and alienate most of America. He hates the Tea Party and can’t stand Ted Cruz. Then you have Ed Rollins of Jeb “Common Core/Amnesty” Bush’s campaign vocally trolling with, “Architect of the government shutdown in 2013,” which will no doubt be the Progressive Right’s mantra during the campaign. These Progressives have no other way to fight someone like Ted Cruz. A man grounded in his Christian faith and love of the Constitution. Alan Dershowitz, who was his law professor at Harvard, said that he’s probably the smartest student he ever had and it is widely said he is a world class debater. I would say he’s arguably the brightest mind in the Senate today. True conservatives were thrilled to hear Ted Cruz’s announcement for the presidency in 2016. The students at Liberty University gave him several standing ovations. In his fantastic speech, I flashed back to the stirring speeches given by Trevor Loudon and the recipe to save a nation beleaguered by Marxists. Cruz brings something to the table for everyone across the political spectrum. Most importantly, he brings honest hope to a weary nation. I heard the echoes of history and our Founding Fathers in his words. It was refreshing… it was an atmosphere, a feeling, I have not sensed since Ronald Reagan. I truly believe that Ted Cruz is the last best hope this country has. We’re running out of time and fast. Cruz told some of his personal story in his announcement and it was riveting. How his mother was one of 17 children and grew up to be the first in her family to go to college and become a pioneering computer programmer in the 1950s and 1960s. I was the first to graduate on my side of the family as well from college. My degrees were in Management Information Systems (programming) and Accounting, so I found that very revealing. He spoke of his dad’s struggle in Cuba and his coming to America. He spoke of his father and mother becoming Christians. He covered how his wife grew up baking bread and going into business. Cruz shared how he worked two jobs to put himself through school – so did I. Ted Cruz and his family struggled with the same struggles the rest of us go through. It took years for him to pay off his student loans – he had far more to pay off than I did, but I can relate. This is why Ted Cruz is loved by the Tea Party, by grass roots, by Christians and by America in general… he may be an outlier to the GOP and DC, but he’s one of us and part of the real American family. Cruz is right… this is our time… this is our fight. To each generation comes a unique time to stand and fight for what you believe in. Ours is now. So many of us under the tyrannical boot heel of the Obama Administration have grown weary; have all but given up. We have waited and prayed for a Reaganesque leader. That leader is Ted Cruz. It is appropriate that Ted Cruz quoted Patrick Henry this morning with “Give me liberty or give me death.” Because that is where we find ourselves now. Either we will turn the tide in this next election, if we make it that far, or the Republic will be lost to us or it will be embroiled in another Civil War. This is what Ted Cruz is asking you to imagine. He wants you to envision millions of Americans coming together to restore our country to its glory and to purge our leadership of those that are tearing her down and who are self-serving and corrupt. Our nation stands at a cross-roads as we have so many times throughout our history. I agree with Ted Cruz – God is not finished with America yet. Everything can change in an instant if we will only stand and fight together. It is a time for truth. It is a time for liberty. 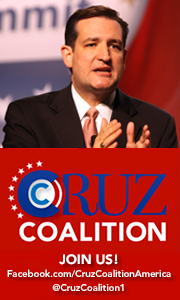 It is a time to reclaim the Constitution of the United States, just as Ted Cruz stated today. As Constitutional Conservatives, our hour has come. We dare not ignore the call. Ted Cruz’s presidential announcement transcript.